Each week I write a brand new article for members of our three wonderful art groups on Facebook, The Artists Exchange, The Artists Directory, and The Artist hangout. This week we take another in-depth deep dive into the world of creating video to showcase and market our artwork. For the last few years the world seems to have gone video crazy. In fact there’s a level of video crazy that I don’t recall seeing since the days of Betamax and VHS. Back then of course watching a film meant that you would need to visit a video rental store like Blockbuster and peruse the hundreds of video cassette covers that were neatly placed on the shelves. If you had Betamax which was thought at the time to be the technically better of the two main systems, you would only have a disappointing selection of videos to choose from compared to VHS and the displays were frequently more chaotic. Perhaps that says something about whoever owned a Betamax, or it could just be that no matter which blockbuster you wanted to borrow, it was only the Betamax section that had it available for rent. Betamax eventually gave way to VHS. The Beta machines were definitely superior in build quality and performed better in lab tests, but they had poorer sound than VHS and fewer whole product features such as the ability to record at a lower resolution on long play and long record. VHS technology came into the market at a lower price point and the tapes used for VHS were significantly cheaper too. So in a market that was once dominated by Betamax, VHS eventually took over the world. It was the Netflix versus Prime Video battle of the day, but one of the joys of visiting Blockbuster was that it was often like visiting an art gallery. Film makers wanted their films to stand out on the shelves so the covers had to be eye catching, as did all of the promotional material that went on display every time a new film was released on tape. A walk around Blockbuster back in the heyday wasn’t like walking around any other store, it was an eye catching festival of marketing, they offered an experience before retail experiences were even a thing and the staff were knowledgeable because they had seen nearly every film, and I really do miss Blockbuster. Binge watching an entire series meant repeated visits to the rental store and some of those stores would impose restrictions on the number of tapes you could take home at any one time. So your binge watching habit back then had to be stretched over a week, sometimes even a month and if it was many seasons long, it took as long as it would take for you to save up enough money for the rentals. Millennial's have no idea of the struggle back then and this wasn’t that long ago, the last Hollywood movies to come out on VHS were released in 2008. Not too shabby for a technology first released in 1977. Where will we go in the future? We already have streaming services from Netflix, Prime Video, Hulu, and in the UK we also have Sky, and now even Apple are pulling in video services and federating them out via a single app. It seems that everybody wants in on video. Right now we are seeing the demise of physical video media, in the future there’s a roughly 100% chance that streamed and downloaded video will be the new DVD and Blu-ray. PlayStation Five, I have money on that one not having a disc system at all and the discs that you already own for the previous PlayStation's will be transferred into a service like Apple Music. If you own it, you will still be able to play it regardless of the system you purchased it for as long as you subscribe. Why do I come to this conclusion? Look at the patents submitted over the past few years from Sony, look at their PlayStation Now service, look at the decimation of high street stores and Sony finally pulling download cards from physical gaming stores. It starts to show the path leading us towards a truly digital future. Then work out the production costs of physical media, take into account Google Stadia and Apple Arcade along with Sony’s and Microsoft’s online gaming offerings, and then do all the math. My prediction, PS5, disc-less, and with the future looking to 8K to provide the visuals, it makes more sense to stream than it does having to insert multiple discs and at some point in the future, why even bother with a home based console at all. Bandwidth and latency will be the buzzwords over the next few years because 8K will need both of those in spades. It is truly mind-blowing at just how far we have come with video and a huge leap from the time I started creating video some 34-years ago. 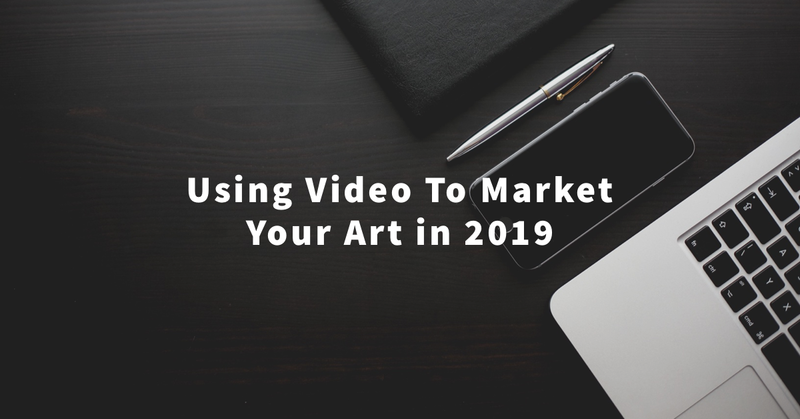 So as artists it kind of makes sense to look towards video as another tool in the marketing toolbox. The problem is that most of the videos we see on social media have been cobbled together in five minutes with an app on the phone and the results are nowhere near Hollywood. It’s not that creating video on a phone is bad, I have seen some brilliant stuff but it’s usually because the app of choice to create that video with that is the wrong choice. The other gorilla in the room is that video has been getting some bad press on social media when it comes to recording the video Ad metrics. Facebook erroneously gave the wrong metric information so the emergence of video as a go to, must do, was probably a little premature but it is now finding its feet and video is now a go to, must do. The quality of any video today regardless of how it has been created seems like witchcraft compared to 1977, but this is 2018 and we need to compete with the Netflix’s and Apples of the world if we want eyes on and people to return to your pages and videos. Or, you need something else in place that makes up for the low technical quality of the production. We need to use video to reach our markets, but more than that we need to produce high quality video that people want to watch and share, so we need to up our game and have a great visual story to tell and at that point it matters slightly less about the technical quality. The problem here though is not only the limited budgets we have to produce video, but also the limited time we have to create good video that people want to watch. Creating good video is an art form in itself and it needs the technology to build it in place. The issue here though isn’t just the technology that you need, it is the skill-set required to make compelling and quality video and the time it takes to produce it and then edit it. Take a visit to the Newbie Film School website which you can find right here, and you will see just how much professional video creation costs. An average short film costs between, $700 to $1500 per minute but if the story demands a significant production those costs increase to $25000 per minute. This should give you an initial idea about what is potentially involved in producing video. Those figures are mind-blowing and for the amateur filmmaker/professional visual artist, way out of reach to produce a short work in progress video or even a video showing your latest release. Thankfully you still have plenty of options and those options are exactly what we will be taking a look at today. If you can’t afford to hire professional film makers to create your video and few of us can, you’re not on your own. As artists we hate the phrase “please can you create it for free and I promise that you will get great exposure,” and a lot of good video producers hear that phrase a lot too. So you either have to bite the bullet and pay or you need to start learning the skills to create something that is good enough to present on your own. Producing video on your own is easy, producing great video on your own is really hard. Producing great video on your own with hardly any budget, even harder. If the video is covered in the watermark of the app you used to produce it because you didn’t pay the dollar or so for the in-app-purchase to remove it, it will detract from the video and cheapen your image. Small details like this can really hinder perceptions. If the production is poorly constructed people will lose interest within the first few seconds and they will switch off. Besides the visuals though there is a secret to keeping a viewer engaged even if the quality of the film isn’t very good, and that secret is that you need a compelling story. As for the equipment, well I can tell you from my own experience that professional filming equipment doesn’t come cheap and you have to know how to use it. Video is something I have been doing since I was about 16-years old when I took a job selling high end video and audio equipment to get me through my studies. Instead of saving up for my studies though I invested in a video camera which delayed the studies I wanted to undertake for a couple of years. But that’s another story for one of those one day I will write about it blogs. The expense of the equipment and the skills needed in video creation are the two reasons why professional productions have entire crews and whenever you start talking about entire crews you start racking up the costs. Chances are unless you collaborate with other artists, that you will be doing a lot of what you do on your own and with very little budget if any at all so there has to be a compromise and it might help to consider collaboration. It is entirely possible to shoot a good quality film these days with a most modern smartphones, but compare the output to something produced on a high end specialist film camera and you will notice a huge difference in the quality. 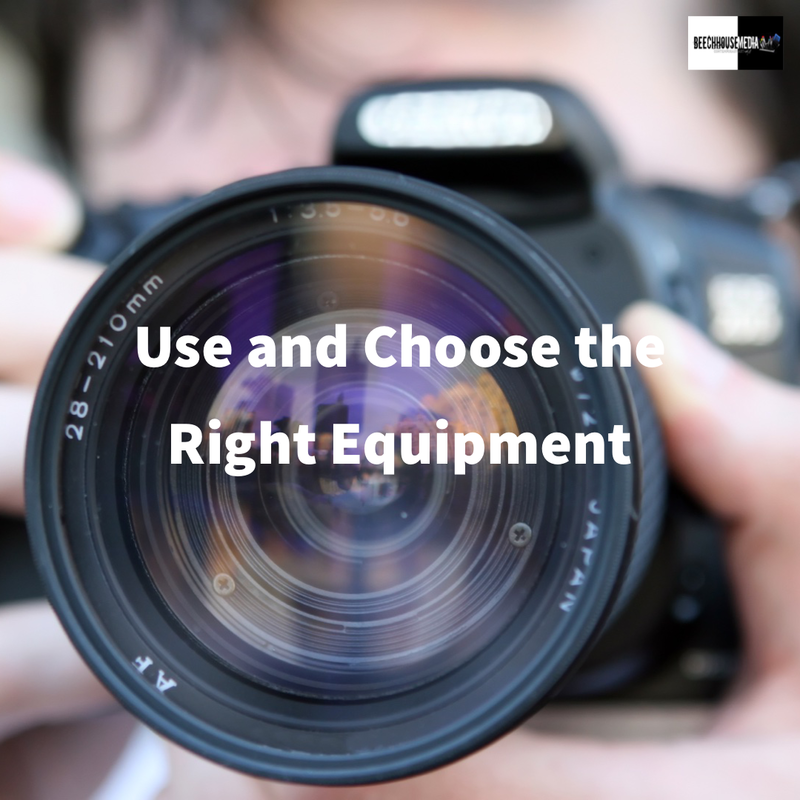 You have to be smart with your choices and even renting a high end video camera and the equipment can be eye-wateringly expensive and you still need to know exactly how to use it. So compromises have to be made with the knowledge that a good visual story is something you need either way. So how do you get great results without the cost? Well, you have to be smart with your choices and you need to have at least some idea of how you want the end result to look. Once you have an idea, you might then have to temper down expectations because your smart-phones camera isn’t going to compete with dedicated film cameras. But if that’s all you have then you need to look at the range of editing apps available and maybe invest a little in purchasing the right application. Here’s where you have some tech choices to make if you are planning to make a purchase. Let’s assume that a high-end dedicated camera is out of reach, where do you even start because so many cameras and smart phones can do video so well these days. Ideally you want something that is not only affordable, but will give you some help along the way and which doesn’t cost the GDP of a large country. You also want something that is portable enough to carry around and this is where the pro-level cameras that have been made for the job start to fall down, they’re all so big and expensive, I mean like really expensive. My go to every day equipment is an iPhone and an iPad Pro (2018), GoPro and a Panasonic Lumix camera, and all of them have the ability to shoot very good video in 4K without any significant issues. I’ve used this combination professionally in the past too and have just traded up my older Panasonic camera to one of the newer models, you probably won’t have to go that far but this was essential because I do a lot of work with video. I still own some high end equipment but now the technology has moved on and some of that more expensive equipment is showing its age. At some point the new Go Pro Hero 7 will be on my list because that little action camera has some seriously great stabilization features meaning that you can do away with having to buy a gimbal which if you have never purchased a decent gimbal makes the Hero 7 a real bargain. If you are thinking of buying a new camera to get yourself started you will probably be looking for something that not only shoots great quality video but also something that can take great shots of your artwork. This is where you need to take a cautious approach or it could end up costing you money you don’t need to spend and compromising quality. There are pitfalls with some cameras. Many of them will be sold on the basis of having lots of features but some of those features are often really just gimmicks or have only limited use. An example of a sort of hybrid useful feature/gimmick is 4K photo and this is something you will see a lot of across various manufacturers. But the thing is, that while 4K photo sounds exceptional and a must have, in reality it is an 8-Megapixel photo which is probably lower than the number of pixels your smartphone camera already has. The difference though is that 4K photo is really 4K video but the end result is that you can have a 4K photograph with clarity. It’s a form of burst shooting capturing images at 30-frames every second, which gives you some impressive results and allows you to freeze frame on the best millisecond of footage and generate that as a 4K photo, albeit still an 8-Megapixel image. Great if you are producing stills for use online or for on-screen display or action shots, not so great if you intend to crop it or use it as a source image in a final printed product or you just want to take a high quality shot of work in progress. However, you also have to look at things like the size of the camera sensor. The sensor on your phone camera is likely to be much smaller than the sensor on a dedicated camera. When it comes to megapixels it doesn’t mean that bigger is always better. Again this is where manufacturers can be a little over optimistic in what they advertise and whilst a high number of megapixels can be a sign of a great camera you really have to understand how the images are made up. Compare a 16-Megapixel phone camera to a dedicated camera with just 12-Megapixels and the differences can be shocking, but not in the way that you think. The phone is more likely to have a much smaller sensor than the dedicated camera and might have much smaller pixels. The smaller the pixel the more susceptible to noise and the poorer the image quality. The other thing you need to take into account is just how much storage you have on your phone, the higher the number of pixels, the more storage you need and with most phones you won’t be able to just insert a bigger memory card to fill it with photos. Apple have gone some way to address this by introducing a different file format which saves photos in the HEIF format for photos and the HEVC (H.265) format for video so you will be able to store more in less space, but some manufacturers still save their photos as jpeg’s and this isn’t the best option for saving photos. A dedicated camera on the other hand will probably allow you to take RAW images which are much easier to edit because they capture all of the image data when they capture the photo. I will leave the nuances and the benefits of RAW versus JPEG for another article but here’s a thought. You could go for a slightly older version of your next high-end smartphone and the difference could be enough to buy a reasonable point and shoot camera with a much bigger sensor than the one that’s on the latest phone model and a point and shoot which is also able to produce good quality 4K video and shoot in RAW. Certainly something that’s worth considering because it is true when they say that the best camera to own is always the one you have with you. Once you have chosen your equipment it’s time to shoot some footage. Remember when I said that you needed a compelling story to make up the shortfall of not being a professional film maker? Even professional film makers can focus too much on the footage rather than the story but good professional film makers will create a story board and do both. The benefit of doing this is that creating a story board will give you a much clearer idea around the kind of footage that will work in your video project. That footage could be a tour of your studio or a view of your process as you create your next masterpiece, and the story board might start off with the tour before moving on to the creation. The story board allows you to think about the order of footage that displays as the story plays out. The best videos never just happen, they’re usually a combination of planning and preparation and they always have a beginning, a middle, and an end. One of the things that I do all of the time is shoot reference images to give me inspiration for future artwork but something else that I do a lot is to shoot random bits of video too. My daughter is studying animal welfare and she gets up close to a lot of endangered animal species. Now she’s in the habit of making sure she films the really interesting practical aspects of her studies and then builds up a library of footage. I do the same but with much less interesting topics but none the less, this footage can still be very useful. These short clips are ideal to use as B-Roll footage. B-roll footage is essentially any footage that isn’t part of your primary subject. So background shots, fillers, a walk down the street, it doesn’t matter what your library of B-roll footage is because at some point you will find a project to use it in. Some video creators shoot nothing but B-roll footage and then sell it online as stock footage and this is something I have had a measure of success with doing in the past and even to this day I still sell some of my older footage. Some days I might just go for a walk and capture something that someone else wants to use in their production. It’s a great little side industry and it can be profitable too given how much good stock video footage costs. I will write another article on the art of shooting good B-roll footage in a future article and I will cover aspects such as the lighting and the rule of thirds because those rules apply just as much with video as they do art. Today though we will focus on getting you up and running to create your first near pro-level film. You now have the equipment and you finally have some footage, but a film without music is just another clip. This is where the real problems start. Social media platforms such as Facebook and YouTube have policies in place which mean that you can’t add professionally produced music or the sounds from a copyrighted source, and the algorithms detect known pieces of music and automatically remove the audio. Just as we visual artists don’t like people who steal our art, sound producers and musicians don’t like you stealing their music and as we’re all creatives, we should be sticking together and supporting each other regardless of the creative sector we are in. But this does make the inclusion of sound problematic so we have to look towards Open Source sound effects and music. Facebook have an entire library in the Facebook sound collection when you sing up for free as a creator in the Facebook Creator Studio. You can do that right here. The alternative is that you think about creating your own and honestly, that’s not always as difficult as you would first think. Now you are probably never going to be the next Mozart or Jay Z if you are anything like me, but that shouldn’t stop you from creating something that adds at least some audible interest. Given that for a number of years I DJ’d back in the days when I was much younger, I like to think that I at least have an ear for tonality, others who have listened to me sing in the shower will strongly disagree. I definitely can’t sing despite having to stand in for a lead singer in a friend’s band for one night many years ago, but the clue here was that it was just one night, two songs, and then we felt that having no vocals at all would be the better call for us and the audience. One of the musical things I was once able to do was to bang out a tune on the piano. All of those piano lessons I had when I was a child must have rubbed off somewhere but I’m certainly not a professional when it comes to tapping the ivories. I can play chopsticks like a pro, I can even play the theme to the Pink Panther. I can play some simple tunes by ear because I can’t read music, the problem is that I no longer own a piano. I do however own an iPad Pro and a Mac Book and every Apple device comes with a software package called Garage Band, even the iPhone comes with this pre-installed. If you’re not into creating music Garage Band is a package that is often ignored or only played with occasionally as it comes pre-installed on new Apple devices. But take some time out to learn how to use it and you will find that it becomes relatively easy to knock something out that sounds better than some of the stock soundtracks that everyone else is also using. Be warned, playing around with Garage Band won’t suddenly turn you into a professional musician, at least not without years of practice and some additional equipment. Learning and playing around with it will take some time away from your other creative endeavors while you come up with something that works and while learn how to get the best from it too, but give it a couple of hours and watch a few tutorials on YouTube and you will be able to come up with something that you can use. Learning the nuances of Garage Band is like learning anything else, you do have to put some time in to get the best results out of it and logging on to the global learning academy we like to call YouTube will probably be the best place to start. YouTube is where I first learned some of the tricks and tips around using Garage Band and I have been using it for a few years now. Whilst I’m not thinking of bringing out an album anytime soon because I have way too much respect for professional musicians to even try, it is scary that Garage Band can make you sound like a half decent musician or at least once you have begun to tackle some of its challenges and worked out that it really is often just a simple case of building up loops and placing blocks of sound onto a timeline. Garage Band also allows you to create loops which you can place into your tracks, it also allows you to use a virtual piano keyboard or a set of drums, my advice is to just play with it and wear headphones because anyone close enough to hear what you create initially will probably tire of hearing it very quickly. Within the provided loops you will also find loops with sound effects. Fire up the virtual synth and press a key and you should be able to start building up a library of sound effects and start to create tunes that might add that all important audible interest to your movie. So now we have the equipment, some footage and some sound, now we just have to pull everything together. Here’s where it gets to be really fun, or not. This is the point that you really need to consider using software or applications that have been designed for creating video. If you have a photography plan or above from Adobe Creative Cloud you will already have access to the premium features of Spark Video, and regular readers will know that I have been a fan of Adobe Spark Video and Spark Post since they were first introduced. With each new update, new features get added and the products offered today even on mobile devices are significantly better than most of the hobbyist and so called pro-apps on any of the digital market places. You can use Spark without subscribing to Creative Cloud but if you want premium features and tools such as removing the watermark, then a CC subscription is the way to go. Spark is available across multiple formats and on the web, as are many other apps but bear in mind that there are plenty of video apps that have been designed more for the casual let’s have some fun type of user. That’s not a problem if you want quick and easy but the problem arises when lots of other people want quick and easy too and every video produced starts to look the same. Here is where you have plenty of choices. Adobe Rush seems like a good option for those who are subscribed and Premiere Pro is a great application but both of those come with the need to subscribe. 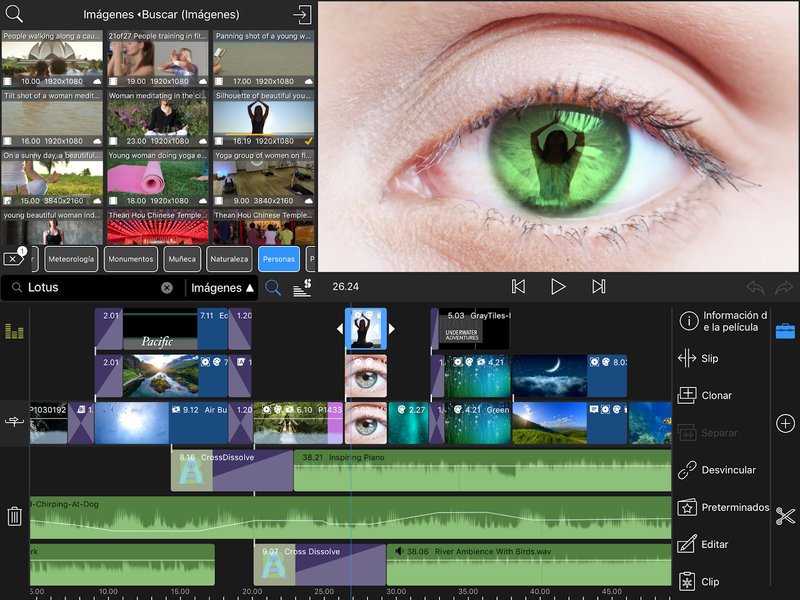 There are some free editing suites that will take your videos to a level that many of the hobby apps will never reach, and most of the free tools are available on Windows and Mac. Blender – Windows, Mac and Linux, is one of the more advanced editing suites which you can find here. Be warned that this comes with a steep learning curve though. Lightworks – Windows, Mac, Linux, is advanced but just like many other editing tools the learning curve can be brutal for the inexperienced user. To get to the top tier of tools such as the ability to create 4K video or to export to YouTube you will need to upgrade to the Pro version. Lightworks is available here. Shotcut – Windows, Mac, Linux, and this just like Blender is fully Open Source which means that every feature is free out of the digital box. There’s plenty here to take you from looking like a hobbyist film maker to pro, but it does have a few quirks. Again, the learning curve is one that will take some time to climb through but it is filled with features that make it very useful. You can find it right here. Adobe Spark – iOS, Web, the joy of Spark is that if you have even the Photography CC plan which is the cheapest Adobe offering, you can access premium features. Without the subscription you can still access the features but some do have restrictions. There are free soundtracks which are what I like to call social-media safe, and the learning curve, well, there really isn’t much of one at all. 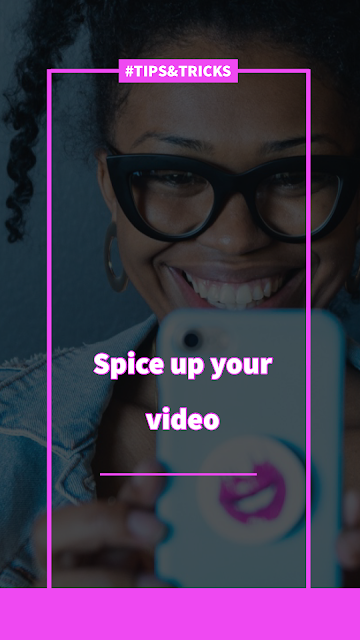 Spark Video (they also have Spark Post and Spark Page) is designed to produce quick videos for social with professional themes. It’s a solid application but it doesn’t go anywhere close to offering the features of Adobe Rush or Premiere Pro. You can find it here. The only downside with Spark is that it is limited to iOS (iPhone and iPad) at least for now, but you can access it through a web browser online by clicking on the link above. 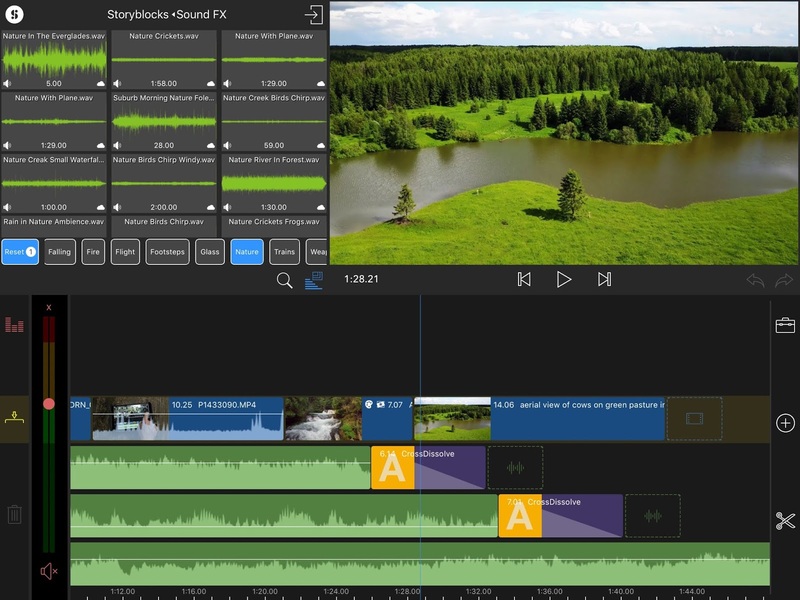 If you have an Apple device then the obvious choice for editing is probably getting to grips with and using iMovie, and to be fair iMovie has been used to create some great quality videos over the years. The downside to iMovie is that its use is really intended for home movies created by casual users. Great for social media, maybe even the odd film on social channels and for most folks it is more than enough to bring together sound and images and come up with something that looks professional. There’s a bunch of stuff you can do with iMovie such as adding in titles and end credit drops so it is still a useful tool to have in your video creation toolbox, but if you want to really start to go up a level and produce video with professional grade transitions and effects, you do need to look elsewhere. You need the simplicity of iMovie but with some of the power from some of the big software and application packages used by many of the biggest film studios. That’s a real ask. Not only do you want some of the features found in the big packages, you have to have the equipment to run that level of editing. Even some of the free packages above need a reasonably up to date PC or Mac, and if you are using older technology, you might struggle with new and future updates and with poorer overall system performance. As artists there’s a chance that most of us don’t have studios and homes filled with high-end rack mounted servers and computers, and even some expensive PCs can struggle processing whole movies in 4K resolutions. So what I am about to suggest will seem unbelievable, yet the application is available right now and it runs on both your iPhone and iPad. All images (C) LumaTouch and used with permission. 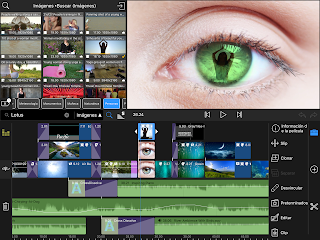 LumaFusion is the single best application to ever grace a mobile device when it comes to video editing. 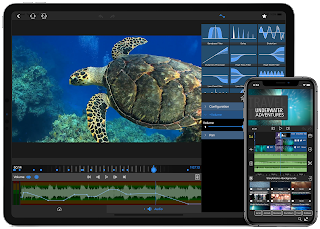 Luma Touch is a world class leader when it comes to video editing on mobile and LumaFusion brings studio quality editing on to the iPad and iPhone for less than twenty-bucks. This my friends really is a game changer for those of us who need to make edits without being tied to the desk. I don’t say that lightly, regular readers will know that I am frequently unimpressed with applications that have an over-reliance on ongoing subscriptions, and which nickel and dime the end user for even the most simplest of functionality. This is another area in which LumaFusion wins hands down. There is a single in-app subscription available to access Story-Blocks which in the UK comes in at just under £10 per month, or just under £70 per year, but you don’t have to subscribe to this and it is only needed if you want access to lots and lots of copyright free stock footage, music and sound effects. It is something I certainly want to take advantage of at some point, guess I need to sell a few more pieces of artwork first! But the application itself is a remarkable feat of coding and visual engineering and especially when you consider that you can produce studio quality visuals right on a mobile device. There’s no need to worry too much about storage either as out of the box the application will support pretty much any storage option you already have. You can manage projects easily through in built project management but it is the, what you can create that makes this application so very special. 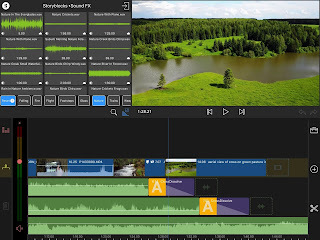 LumaFusion is a powerful multi-track video editor used by mobile journalists, filmmakers and professional video producers to tell compelling video stories. If you are a professional or aspiring producer, journalist, or filmmaker, if you have a video story that’s begging to be told, if you want to use the latest technology for iOS; LumaFusion is the premier professional video editing and effects app for you. If you’re not a “Pro” yet, their video tutorials, world-class free support, and an incredible community of video enthusiasts and professionals on the forums will help you get there. 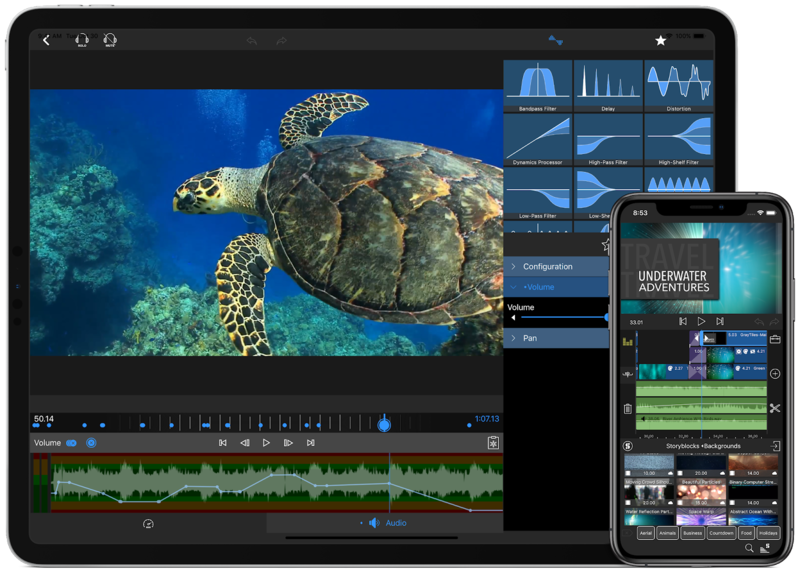 LumaFusion is produced by the original creators of the award-winning Pinnacle Studio App, and this time we’ve created the most powerful tool ever for mobile video editing. A Pro I/O in-app purchase will become available which works with LumaFusion / GNARBOX integration, which will allow those with large amounts of media to start wirelessly previewing and editing media from GNARBOX inside LumaFusion while at the same time background importing any media that’s added to the timeline which will add a further $29.99 to the price eventually but not if you don’t need that level of professional features. Unless you are using this to create broadcast video over the air, it’s hard to see a reason to add much beyond the initial app price and maybe if you really want to play around, a subscription to Story Blocks. As it stands, if you are editing video on the iPhone or iPad, and you demand professional level results, this will hands down be the best investment you will ever make after you have purchased your device. If you need a mobile video editor for pro-use, LumaFusion is the reason to go out a drop your cash on an iPad Pro. It really goes beyond even a pro-sumer level and puts the tools that studios have been using for years right in the palm of your hand. So you’re probably wondering what the learning curve with this one is like, well, if you have used iMovie then it’s nowhere near as steep as you would think and there is a vibrant community forum where you can go to for help and a heap of tutorials not just on the Luma Touch website but from users across YouTube. This is probably the secret app that most vloggers and YouTube stars wouldn’t want you to find. You can find it on the Apple App Store, or take a look at this link right here, which also showcases some of the professional features you will find within the app. In a word, genius. I’m working on creating some video right now and that’s one of the reasons why I haven’t been releasing brand new artworks over the past couple of weeks, although I have carved out some time lately to complete and prepare three new works which will be released very soon. Video takes time, it takes more time to do it well. If you start with the right tools you will see better results even quicker, but underpinning all of this is that need to have a story that people can connect with. If people can connect with you they’re more likely to buy your work, at that point video is another tool in the artists marketing tool box. Of course you don’t have to even go down this path at all to get your work seen but the way social media works we do need to consider that this is one of the indicators that the social platforms algorithms will be focusing on when it comes to surfacing what you post, and video will give that all-important reach as long as you do it well. Let us know if you have had a go at producing video by leaving a comment below and don’t forget that you can leave a question if you are stuck with anything too! If you would like to support the upkeep of this site or maybe just buy me a coffee, you can do so right here!